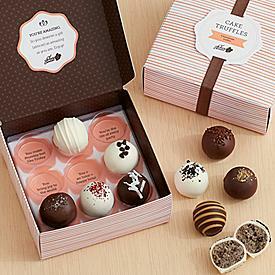 Tantalize their taste buds this holiday season with these Assorted Cake Truffles that are melt in your mouth delicious. Whether your loved ones savor that sweet and salty sensation, a more traditional chocolate or vanilla delight, or a heavenly combination of both, there is something everyone on your list is certain to love when you order these Assorted Cake Truffles this holiday season. These bite-sized gourmet treats make perfect unique Christmas gifts for friends, family members and coworkers alike, or order them as a wondrous addition to your own holiday table. In order to make this gift even more unique, Shari’s Berries has hidden heartfelt sentiments beneath each delicious truffle.